The leader of Greece's Socialist Party, Evangelos Venizelos, says he has made progress in efforts to form a coalition after inconclusive elections on Sunday. Mr Venizelos, the third political leader to try, called his talks with a small left-wing party a "good omen". The head of that group said he was ready to join a coalition that kept Greece in the euro while rejecting the terms of an international bailout. The election saw a huge backlash against pro-bailout mainstream parties. Under agreements with the EU and the IMF, Athens is due to approve fresh budget cuts worth 14.5bn euros (£11.6bn; $18.8bn) next month, in return for financial help worth a total of 240bn euros. Mr Venizelos was given the mandate to start new coalition talks after failed bids by leaders of the centre-right New Democracy and radical left Syriza bloc. On Thursday he met the leader of the Democratic Left party, Fotis Kouvelis, who said he was willing to participate in a broad-based government that would keep the country in the euro but disengage it from the bailout. "I propose the formation of an ecumenical government that will respect the people's mandate," Mr Kouvelis said afterwards. 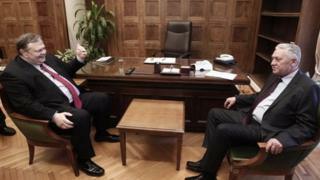 Mr Venizelos spoke of sharing common views with Mr Kouvelis, calling his proposals "responsible and concrete". He added that the meeting had been "a good omen". The BBC's Mark Lowen in Athens says Mr Venizelos' Pasok party is deeply unpopular - seen as the architects of austerity, and tainted with allegations of corruption. It dominated Greek politics for most of the past four decades, but saw its support slashed on Sunday - coming third with just 41 seats, a quarter of its pre-bailout support. If this attempt to form a government fails, fresh elections - and weeks of fresh instability across the eurozone - seem inevitable, our correspondent adds. The latest coalition bid follows in the wake of a failed attempt by Alexis Tsipras, the leader of Greece's far-left Syriza bloc. Mr Tsipras said he had failed to reach agreement with mainstream parties because of his insistence on rejecting austerity measures demanded by the EU and IMF. Previous Greek governments agreed to make deep cuts to pensions and pay, raise taxes and slash thousands of public sector jobs in return for the bailouts. Both Germany and the EU have made clear they expect Athens to honour its commitments. German Foreign Minister Guido Westerwelle said on Wednesday: "Germany would like to keep Greece in the eurozone, but Greece's fate is now in its own hands."